Progressives also need to advance a concrete agenda, and that means taking on Democrats-In-Name-Only. Donald Trump’s provocations have stirred a resistance that is ferocious, diverse, and growing, shaking Republicans and stiffening Democratic spines. Raucous town-hall meetings targeting members of Congress in their home districts are making the fabled Tea Party protests of old look like, well, tea parties. This resistance is vital but not sufficient. While it dramatizes what we are against, our challenge is to integrate it into a demand for all the progressive changes we are for. The danger here is that the default position of resistance is reversion, a return to what was. As Trump assails all things Obama, Obama’s agenda becomes what we have to protect. Trump postures about repealing the Affordable Care Act; Democrats defend it. Trump attacks the Dodd-Frank banking regulations; Democrats protect them. But this can easily descend into the ridiculous: The Trans-Pacific Partnership isn’t suddenly a good trade deal simply because Trump opposes it. Better relations with Russia aren’t a bad thing simply because Trump proposes it. Democrats need to fight, but they need to fight for something. This reflexive defense of the recent status quo is bolstered by inertia, especially at the top of the party. The House Democratic leaders—all septuagenarians—were easily re-elected to their party posts. In the Senate, New York’s Chuck Schumer took over from Harry Reid as minority leader, as long planned. The big outside money is flowing to the same operators (Guy Cecil and David Brock) and the same big institutions (the Center for American Progress, Priorities USA) as before. If Representative Keith Ellison’s effort to head the DNC is defeated, the party structure itself will remain largely in the hands of those who eviscerated it (or their designees). Not surprisingly, these longtime party leaders are invested in what was accomplished under Obama, eager to defend it against Trump’s calumnies, and intent on returning to power under similar terms. 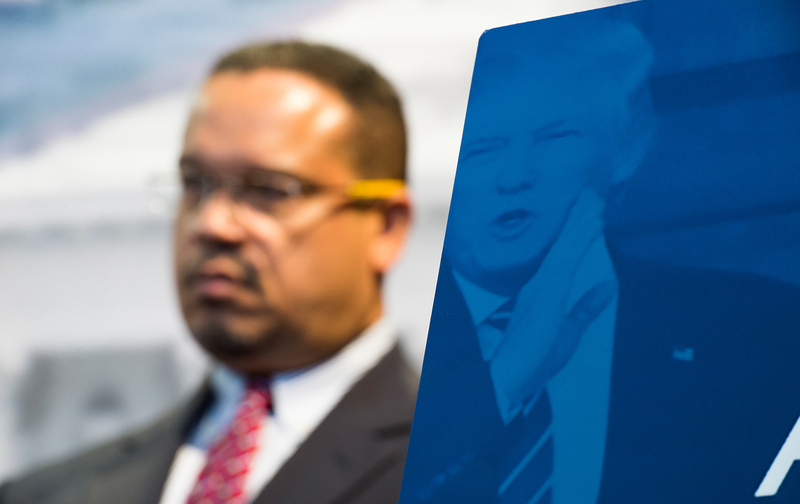 Democrats and citizens of conscience have to stand up and fight against Trump, but their opposition should be tied to a bold, clear agenda that offers real solutions that will make a real difference in the lives of the millions of struggling Americans. For progressives, that requires not simply taking on Trump, but challenging Democrats who don’t get it. Here the right provides an object lesson. With Democrats in control of the White House and Congress in 2008, the Tea Party insurgency, fueled by the dark money of rabid right-wing billionaires, went after sitting Republicans as well as Democrats. The Tea Party produced some embarrassing candidates—remember Christine O’Donnell and Richard Mourdock and Todd Akin?—that kicked away a few Senate seats that Republicans might have won. And yet in 2014, the insurgents took out House majority leader Eric Cantor in a stunning upset. Pundits argued that the Tea Party would doom the Republicans to permanent minority status, and the party establishment raised millions to contain the damage. But eventually, GOP politicians started to listen. Now, the Republican Party holds more power than at any time within memory, while championing an agenda far more reactionary than anything Ronald Reagan would have imagined. On our side, the drive to put forth a program for reconstruction has already begun, led by progressive senators like Warren, Bernie Sanders, Jeff Merkley, and Sherrod Brown. In the House, the Congressional Progressive Caucus, energized by new members like Pramila Jayapal and Jamie Raskin, can provide a voice calling for infrastructure investments, tax reform, balanced trade, and more. Blue states and cities are already building parts of the progressive alternative, particularly in efforts to raise the minimum wage, drive a green-jobs agenda, and increase taxes on the rich to pay for public investments. Meanwhile, the activists of Our Revolution have begun mobilizing to take over state chapters of the Democratic Party. Groups like Our Revolution, People’s Action, and the Working Families Party, plus networks like Democrats for America and MoveOn.org, will hopefully coordinate to recruit and support candidates at every level of government. As the fight against Trump escalates, DINOs—Democrats in name only—will face greater pressure from these activists, and perhaps primary challenges as well. Much of the party’s establishment, backed by some very deep pockets, will decry these efforts as divisive in the face of what they see as Trump’s unifying threat. This is a denial as purblind as Trump’s denial of climate change. Democrats need to fight, but they need to fight for something, not just against the barbarians. They need to be the party of fundamental change, not the party of restoration. For that to happen, the activist base of the party has to challenge sitting officeholders not simply to stiffen their opposition to Trump, but to get with the program.